New Chingus – Hello Korea ! 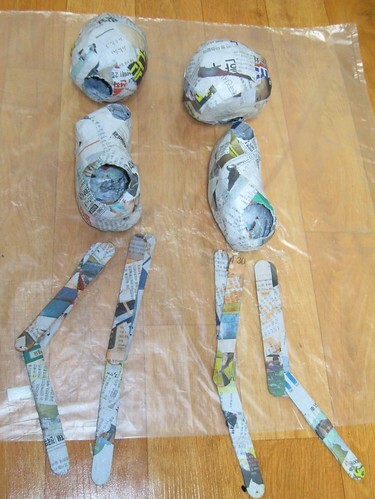 Thought I’d document my new puppet making process for you. 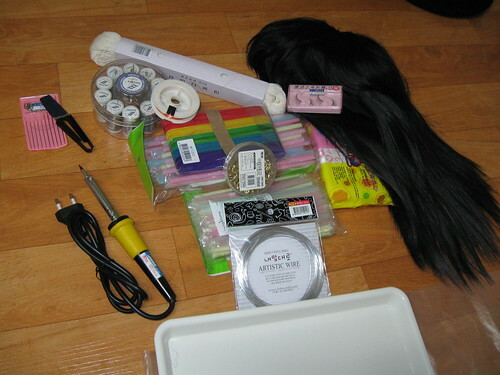 Over the past few months I’ve been collecting low-tech puppet-making materials…wow, that wig was expensive! In the movie Henry and June, Uma Thurman was often accompanied by her puppet, Count Bruga. For some reason, this spoke to me. As Henry’s muse, her tortured manic soul seemed like a different person in the images of her and the puppet alone together. So I’ve always wanted to make puppets for people to animate. As extensions of ourselves, imagination and the world of dolls are repressed as we become adults, but isn’t that what we really need more of? A teenage girl I know has been taken out of school for mental health issues, and so I thought maybe a marionette of herself would be a good companion to have. So I’m making one for her and her sister. When I tell people I like to make puppets, they instantly go on about using them for teaching or plays, etc. But I’m not interested in sock puppets or entertainment. I’m interested in exploring the abiding loneliness of existence and the ways in which we create alternate worlds. The way we animate dolls and the meaning of dolls is of deep significance. My moniker almost human is often mistaken as negative self commentary, but really it is a description of these bodies I feel the need to make. I can’t help thinking that this sense I have of being without people and place is a feeling all people share, and that these bodies we inhabit or that we animate could be therapeutic for others as well.